There are numerous promotional products that could help you promote your business. Some of them are more convincing than other due to their larger size or rather unique design. Still others may have a special benefit in some situations. 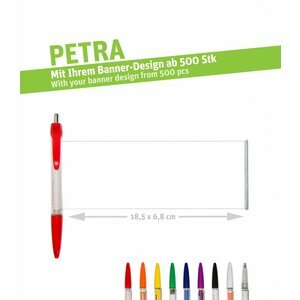 However, with our advertisement pens, we go one step further and present you a promotional product that brings an everyday benefit! 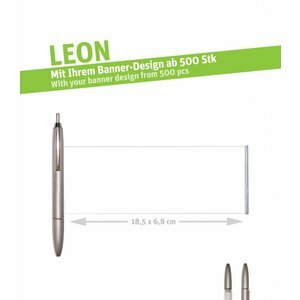 With the sophisticated pull-out banner as your advertisement space not only you get to attract attention from your customers, but also provide them with a product that they will be able to use every day at the same time. Because we all need to write something. And that is what makes our advertisement special. The Infopens are available in different models and colors. 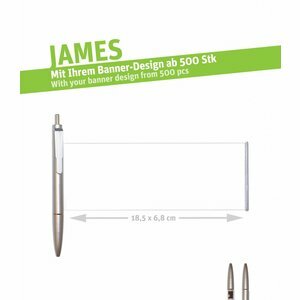 Not only you get the pull-out banner, but you can choose the color to represent your business the best and makes it stand out among other competitors. The different models offer up to 8 different colors. 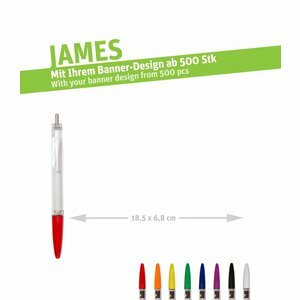 Whether it’s ordinary red or blue, pretty-looking purple, eye-catching yellow and orange or even a fine silver, here you’ll be offered a wide range of color spectrum that meets your goal. The Infopen, which measures 13 to 15 cm long, offers an excellent customization option for the component parts. This allows you to discover different combinations of the grip, the barrel and the end piece. This includes a full-tone variant that are completely colored in full color as well as transparent variant, with the latter divided into two categories. Clear transparent stands for a simple, colorless transparent form. While semi-transparent is indeed transparent, but with a hint of the color of your choice. A special feature are the frosted Infopens, where the barrel gives off the impression of a layer of ice. Even with the clip there are differences. You can get a plastic clip that is designed in round or square. Alternatively, you can also choose a metal clip, which has a higher quality looks and more stable. 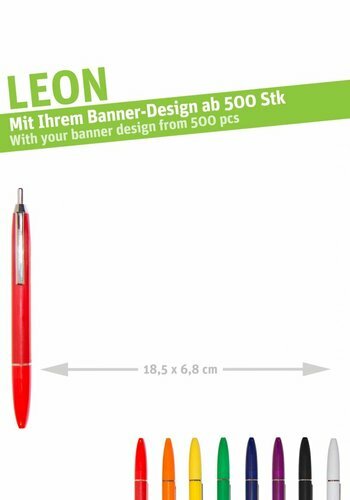 In addition to the design there are other important features of our advertisement pen. 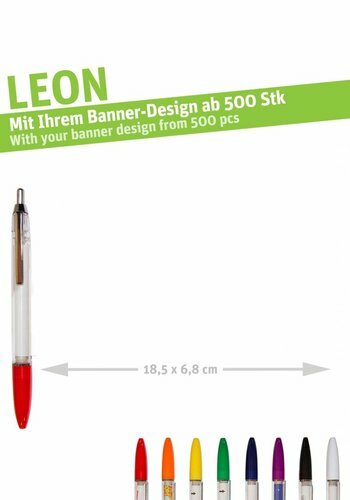 For example, the black ink color is TÜV-tested, so that high quality ink can be ensured. But should you need other color, we also offer blue ink. Additionally, the tip has a 1mm thickness, which makes it easier to change and replaced, if you ever need a new one. 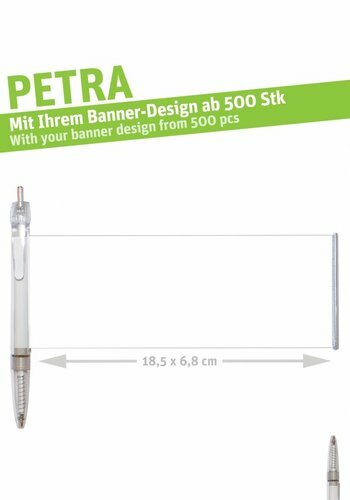 The banner itself can be found inside the banner and can be easily pull-out. 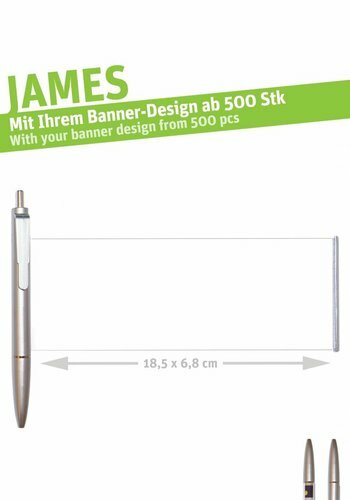 The front side of the banner is coated with plastic and can also be written on. 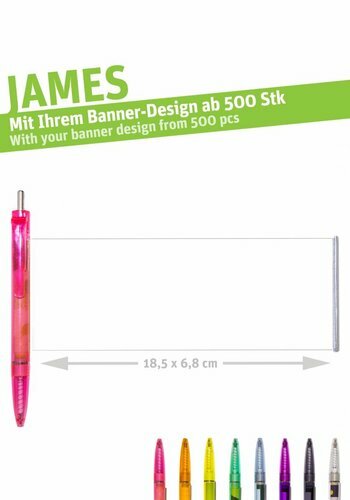 The weight of our advertisement is around 13-14 g, depending on the models, and therefore very light in the hand. Some of our models have an additional feature to them that increase their benefits. 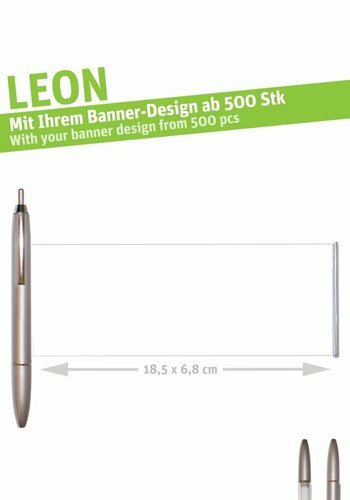 For one there’s the metal applications that not only make the advertising pen look better, but also make it more stable. In addition, the grip is partially equipped with a rubber boot to allow a more comfortable writing experience. 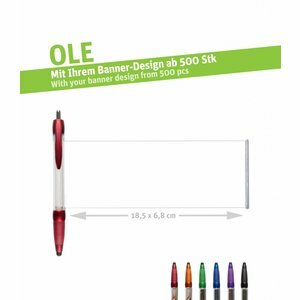 And since smartphones and tablets make up a large part of today’s everyday life, you will also have the option for our touch pens with a pull-out banner. They have a rubber tip that compatible with almost all touchscreens. 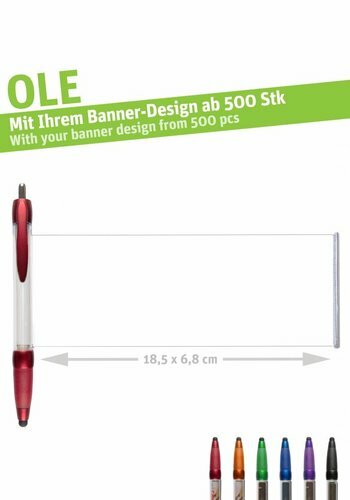 And as if it’s not enough and you wanted more, we have other solution with our 3-in-1 touch pen. Besides having the pull-out banner and the rubber tip, the 3-in-1 touch also has a protector for your headphone port. This will protect it from dust and rain. The great thing about the Infopen is that it lets you achieve the maximum advertising impact while offering an everyday essential at the same time. The advertisement effect is achieved by several parts. 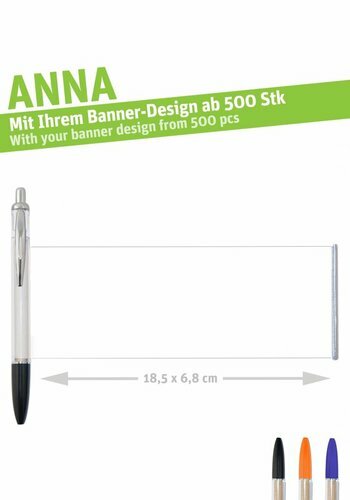 The highlight of the whole thing is no doubt the pull-out banner, which measures up to 18.5 x 6.8 cm. Both the front and the back side can be individually printed on, based on your own design. Here the offset printing method is used. 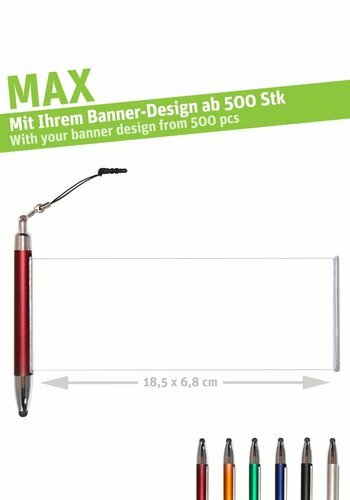 The front side of the banner is coated, which gives people the impression of high quality. The possibilities are endless. For example, you run a driving school? Then simply put on the front side of the banner the schedules for the theory meeting and provide a free space on the back side for them to write down notes for the practical hours. Or you operate a pharmacy? Then you can promote medicines, assist your clients with a calendar or with a list of common medicines for frequent diseases. 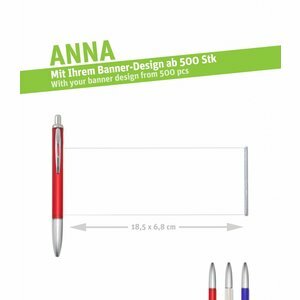 The advertisement pens are also ideal for companies with focus in field service, because you can, for example, put your company contact and address on the banner. 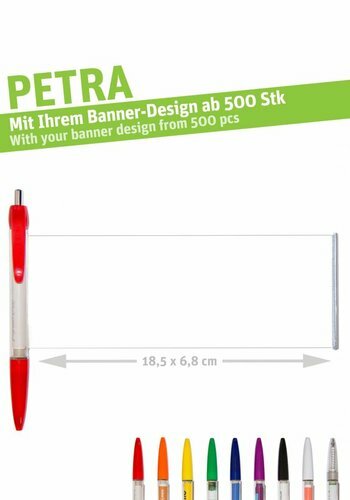 Another space where you could put your advertisement would be the barrel, and in the plastic model you could also put it on the clip. We use the pad method for the printing in the clip and barrel. The maximum printing space for the barrel is 0.7 x 6 cm and for the clip 0.3 x 3 cm! Here, for example, you could have your company logo or slogan printed. However, please note with metal clip there’s no clip printing possible due to its surface. In order to complete your order, you must send us a print file. This should be sent to us in a printable PDF-File format. It is important that the texts are transformed into paths. 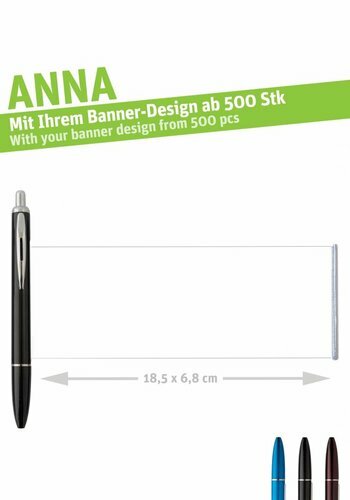 Furthermore, you should always set 2mm cut marks on each side of the banner page. Please make sure that the quality of the file is at 300 dpi to ensure a high-resolution picture. 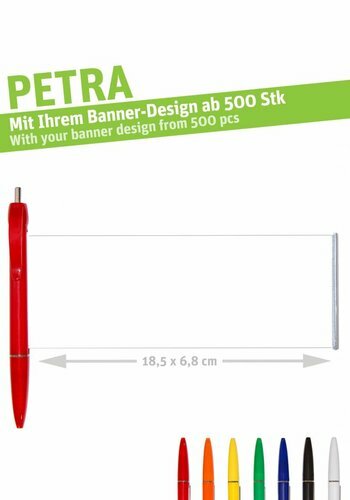 At our online shop we have a large selection of advertising pens with banner, so you have the opportunity to choose your favorite. Each model has their own special feature, which we will introduce to you down below. With the Infopen PETRA you get an allrounder pen with a round clip, which you can get in different colors and versions. 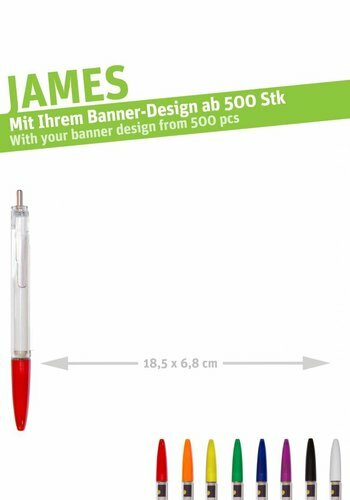 This advertising pen allows you to get both the clip and the barrel to be printed on, thus offering a maximum advertising space. It is available in 16 different standard versions. Here you get plenty of selection that includes a total of 26 standard versions with square clip. 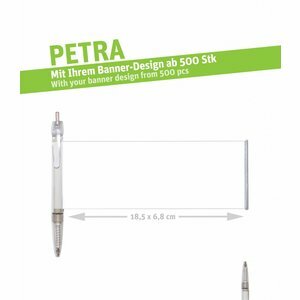 You can look forward to a great advertising effect, because you can get both the clip and barrel printed on. 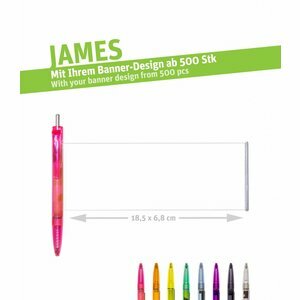 The Infopen JAMES will impress you with its semi-transparent versions, which creates a very special effect. The main characteristic of the Infopen MARY is definitely the rubber grip. A perfect combination of design and comfort is enhanced by the ability to print on the transparent barrel and the square clip. 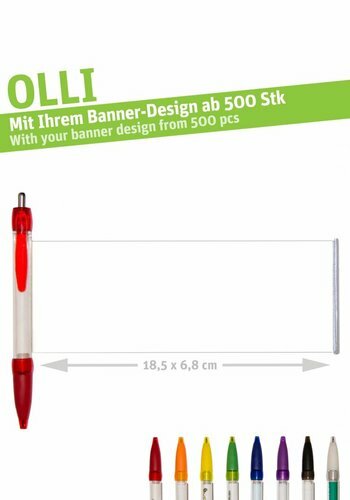 But if you wish to have a round clip instead, just grab the Infopen OLLI! The Infopen OLE delights you with its elegant design and a special function. In addition to the usual banner, barrel & clip printing, there is a rubber that attached to the tip of the pen, making the pen useful as a touch pen as well. Metal applications on handle and end piece ensure a high-quality design. 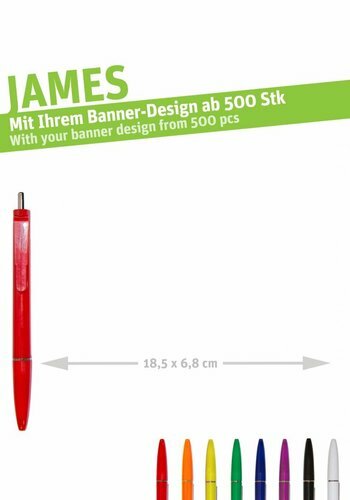 One of the highest quality versions of our advertisement pens can be found with this model. 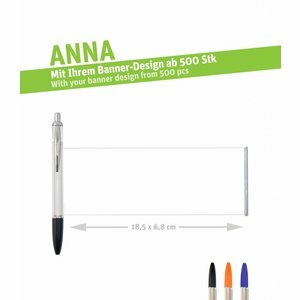 Supported by a metal clip and metal button as well as silver grip and end piece, the Infopen ANNA offers a different vibe. In addition to its newest frosted design, there are nine standard variants, where the barrel printing is possible. If you’re looking for a silver color advertisement pen, the you have found the right one with our Infopen LEON. Equipped with a metal clip and metal plunger, you can choose from several types of barrel and colors. A special design is the silver full color barrel, which gives off an elegant color scheme. 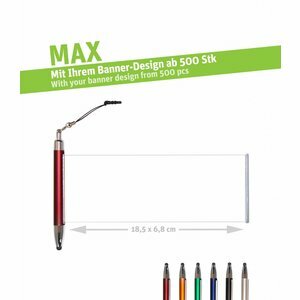 If you are in the search of a banner pen that has multi-functional feature, you will not want to miss the Infopen MAX. 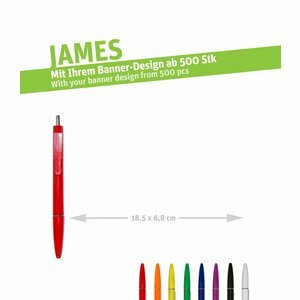 This pen will impress you with the presence of a pull-out banner, a touch pen tip and a headphone jack protector. With its classy design and elegant silver components the Infopen MAX will surely give you a lot of benefit. The full color barrel with metal applications can also be printed on. Order your Infopen now at our Mr. Answer Online Shop! 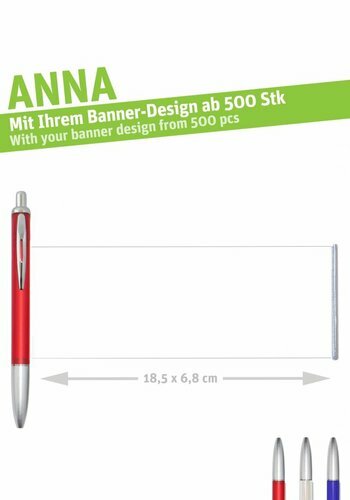 Our variety of advertising pens with banner has inspired you? Then you can make the order easily at our online shop with just a few steps. As a PSI member, we offer you first-class service to help you distribute your advertising messages. 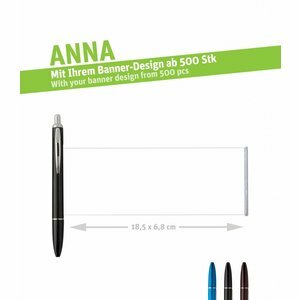 Business customers can use a free sample service to get a clearer picture of the appearance and functions of our advertisement pen. We send you some sample products and you can choose your favorite. We also offer a fast delivery time of only 20 days from the release of the print. Nobody else delivers that fast! Thanks to our best offer, you can really save some money, especially with large quantities order. 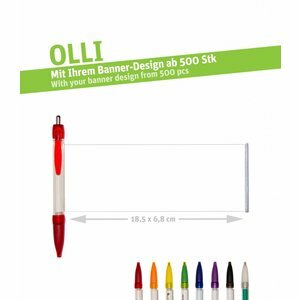 We also maintain an excellent price-performance-ratio, so you will get a good price even with our minimum order quantity of only 500 pieces. If you have any questions about our products, your order or you would like to give us some feedback, the please do not hesitate to contact us. You can reach us by phone, through email or juts use the contact form on our contact page. We look forward to your order.